Remember: you’re all in the same boat. Despite the obvious cliché, this may be the most accurate way to describe the first week of college. It may feel like you’re completely alone, but it’s important to realize that almost every other freshmen you meet during orientation is probably feeling the same way. Think of it as a way to meet friends more easily. Attend orientation activities. Don’t write off that day at the beach or trip to the mall as a cheesy get together. You never know where you’ll meet a new friend. And don’t forget, the people you meet at those outings are there for the same reason you are—to meet other students and (hopefully) make new friends! Get involved. Are you interested in preserving the environment? Do you have a penchant for spoken word? 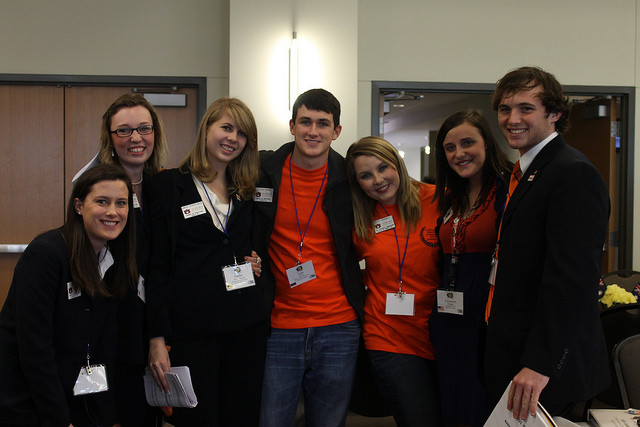 Whatever your interests may be, chances are there’s an on-campus club or organization for it. When your school has a biannual organization fair, grab some fliers and sign up for emails. Even if you only keep up with one campus group, any kind of long-term involvement with one organization looks better than a scatter-shoot of short-term memberships. Don’t expect your roommate to be your best friend. It’s okay if you and your roommate do little more than coexist with one another. Of course, it’s nice if you have a buddy to go to the dining hall with, but don’t feel pressured to hang out with someone if it’s only out of obligation. To avoid any unnecessary conflict, it’s best to contact your roommate(s) before move-in, and decide who is responsible for each shared item. You don’t want to end up with too much silverware and no dinner plates. And perhaps most importantly, under no circumstances can chores be left unaddressed. Establish a weekly schedule— nothing flares tempers like an overflowing trash can. Organize…and stay organized. 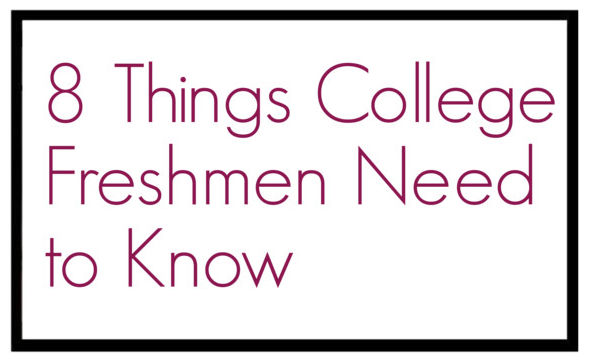 Just like preparing for a shared dorm situation, it’s best to get organized for classes before they start. If you somehow made it through high school without a planner—forget it. With homework, essays, and meetings, it’s nearly impossible to avoid error without a planner. You may remember when a term essay is due, but that’s not to say a class presentation won’t slip your mind. Along with a weekly planner, set reminders on your phone or computer. Copy every due date onto your calendar as soon as you get each syllabus. Manage your time. You may not start class until noon on some days, and on others you may not get back to the dorm until 10 p.m. With an entirely new routine, you are likely to encounter the infamous issue of time management. Along with keeping up with a calendar, be sure you set goals. With term essays, it’s infinitely less stressful (and more rewarding) to divide it up into smaller, more manageable sections. Along with feeling less overwhelmed, you’ll also end up with more time to focus on exams. Find your quiet place. Stake out your corner of the library, find a secluded corner of campus, discover a coffeehouse—these places are invaluable come exam-time, or if you need a little breather from your roommate. Take care of yourself. With classes, meetings, and friends to keep up with, college makes it almost too easy to forget about health. But it’s important to maintain your standards. Most all-nighters are a result of poor planning (read: procrastination), but if you pay attention to how you manage your time, you may be able to avoid a few. When you’re up late or on a busy schedule, pack a granola bar or some fruit. Lastly: exercise. Most students can use their school gym for free. If you are tight on time, even brisk walking several times a week for thirty minutes is linked to a decreased risk of developing cardiovascular disease, and also helps to improve mood.